Because of its popularity and familiarity, Native American silverwork is usually thought of as an ancient craft. Actually, it is one of the most recent to be adopted by tribes in the Southwest. The art of silversmithing by the Southwestern Indian has gone through many changes in technique and style and will always continue to do so. The Indians used coins as one of their sources of silver until 1890, when such use was prohibited by the United States. They then used Mexican pesos until 1930, when Mexico forbade the export of its coin. Since neither country uses silver in their coins today, such prohibition no longer applies. The use of sterling silver in slug and sheet form increased radically in the 1930’s. The sterling was purchased from refineries by traders to sell to the Indians. Turquoise was only sparsely used until the turn of the 20th century, when it became more available. While turquoise is, to the Indians, the most highly prized stone, they also use many precious and semi-precious stones and shells such as coral, jet, onyx, mother-of-pearl, mussel, clam, and abalone, in their jewelry. The wearing of turquoise and silver jewelry has, from the first, been a sign of wealth and prestige in Indian society. By 1900, Indian jewelry began to be popular among non-Indians, and continues to be so today. The Navajo were the first of the Southwestern Indians to learn silversmithing. They learned it from the Mexicans in the late 1850s. At first the silver was wrought (hammered into shape while hot), and sometimes a file was used to cut simple patterns in the silver. In 1875 they began making sandcast jewelry. Molds were made of fine grained pumice or sandstone, with a pattern carved into it. Silver was then melted and poured into the mold. After it cooled, it was taken out of the mold, filed, bent into shape, and polished. In 1890, they began making stamped patterns in the silver jewelry with iron dies or punches, acquired or copied from Mexican leather craftsmen. Shortly before 1900, the Navajo began putting turquoise on some of their jewelry. They would choose the piece of turquoise to use and make a bezel or setting to fit the stone. As more modern tools and sheet silver became available, they became increasingly prolific in the art of silversmithing. This enabled them to cut out pieces (with jewelry saws) from the sheet to fashion leaves, animals and other designs for their silver work. As the Navajo learned new methods of silversmithing, they did not discard the older methods, but instead, combined their old skills with the new. Although they now work with traditional and contemporary methods of silversmithing and design, their work is usually distinguishable by their use of highly worked silver. 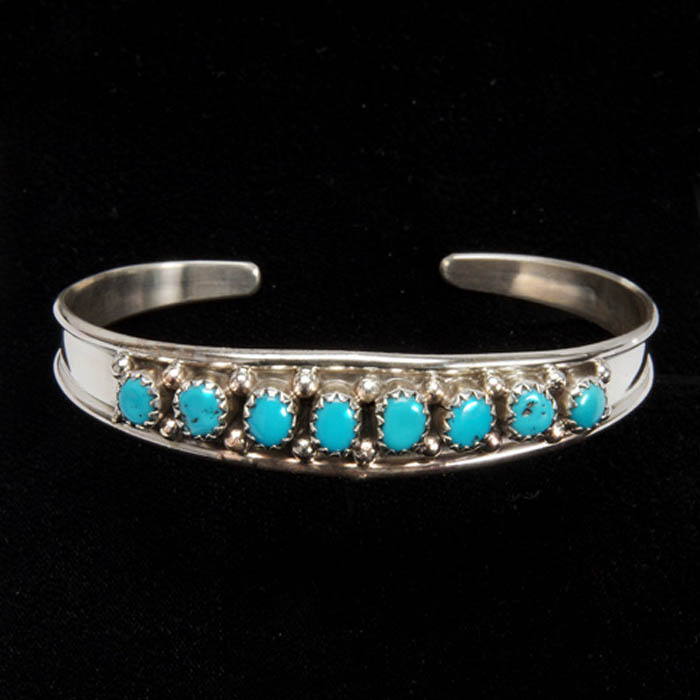 The Zuni learned silversmithing from the Navajo in the 1870s. Their jewelry was similar in style to Navajo jewelry until 1890, when they developed their own new styles similar to what they are today. Silver became the background, or base, and each piece had elaborately designed stone work. The Zuni make the stones fit a previously prepared setting. This is done by using petite point (petti point) or needle point stones in clusters to create the desired design. They also do inlay work by cutting the stones to fit a previously prepared setting. Zuni inlay is made in two styles. One is a mosaic-like design that is made by cutting small pieces of various stones and/or shells to form abstract patterns or designs portraying animals and Native American figures. The complete pattern or design is set into a bezel. The second inlay style is made by setting a single stone into each compartment of a silver divided design. Zuni inlay designs sometimes combines both of these styles in a single piece. Inlay may have either a flat or raised surface. The flat surface is obtained by cutting the stones, inlaying then into the piece and then grinding it flat. A raised surface is produced when the stones are domed or carved, set into the piece and polished. The Hopi Indians learned silversmithing from the Zuni in 1898. Their style was similar to the Navajo style until 1938 when they developed an overlay style. This style used traditional Hopi designs derived from pottery and basket designs. Overlay pieces are made by cutting a design in a sheet of silver and attaching that sheet to another sheet of silver. The Hopi seldom use turquoise or other stones in their silverwork. When it is used, only a small amount is used as an accent in the piece.